The winter in New Jersey always drags long and hard. That’s why we spend so much time rebuilding and tweaking our motorcycles, daydreaming about that first break in the weather when we can roll up the garage door, gas up and kick and kick until the engine sparks and smoke fills the spring air. But this past winter wasn’t like the others. After getting smashed over the head by Hurricane Sandy, things in these parts just didn’t feel the same. Our whole world was flipped upside down. Beaches and boardwalks mostly destroyed. Houses where boats once docked. Boats where houses once stood. Surf spots altered (sometimes for the better). Roads inundated with sea water and sand. 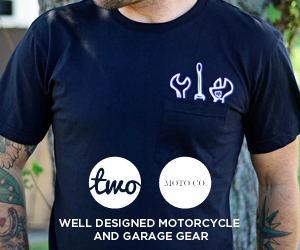 Two Jersey natives, Jason Thomson (editor of The Anchor, www.asburyanchor.com) and Seth Ferris (owner of Two Moto Co., www.twomoto.co) started thinking of ways to give back. 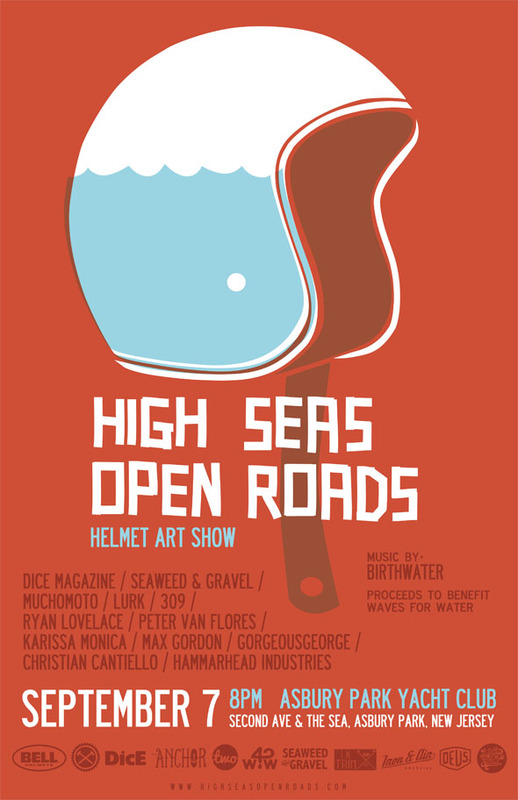 That’s how the “High Seas, Open Roads” helmet art show began. Much of Seth and Jason’s winter was spent reaching out to artists from around the country and bringing in media sponsors to make it all happen. “High Seas, Open Roads” happens on Saturday, September 7th at 8PM at Asbury Park Yacht Club on the boardwalk in Asbury Park. For those thumbing their heads at the sound of a Yacht Club hosting a motorcycle helmet art show, the place is actually a bar and surf shop in one. It’s Asbury’s version of a yacht club, which consists of stiff drinks on a bar stool overlooking the great Atlantic Ocean while talking about the day’s surf session and how many fish you caught off the jetty. Owner Scott Szegeski, an artist and surfer who also owns Woodshop Skateshop in downtown Asbury saw his surf shop Lightly Salted and restaurant next door, Langosta Lounge, catch heavy damage during Hurricane Sandy. They are both back up and running along with the new addition of Asbury Park Yacht Club. All proceeds from any helmet sales will go to the charity Waves for Water. But Ferris and Thomson didn’t just reach out to individual artists. They also approached the creative departments at Dice Magazine (Los Angeles and London), Seaweed and Gravel (Encinitas, CA ) and Hammarhead Industries (Philadelphia, PA) to submit helmets for the show. All are on board. Other artists include Lurk (aka Russ Morland) from British Columbia, Canada, 309, also from Canada, Mucho Moto from Chicago, Ryan Lovelace, a surfboard shaper from Santa Barbara, CA, Peter Van Flores, a Brooklyn native who now calls Orlando, FL home, Max Gordon from Philadelphia, PA, Gorgeous George from North Carolina, Christian Cantiello from Philadelphia, PA and Karissa Monica of Asbury Park. Iron and Air Magazine of New Hampshire, Deus ex Machina of Venice, CA, The Anchor, Two Moto Co. and Lightly Salted, all of Asbury Park, NJ, and In Trim Surf Co. of Bradley Beach, NJ as well as Bell Helmets are also sponsoring the event. Music will be provided by Jersey based band Birthwater. There will also be raffles and giveaways. Bikes will also be on display. For more details, hotel information, directions, etc. please visit www.highseasopenroads.com or email us at asburyanchor@gmail.com. 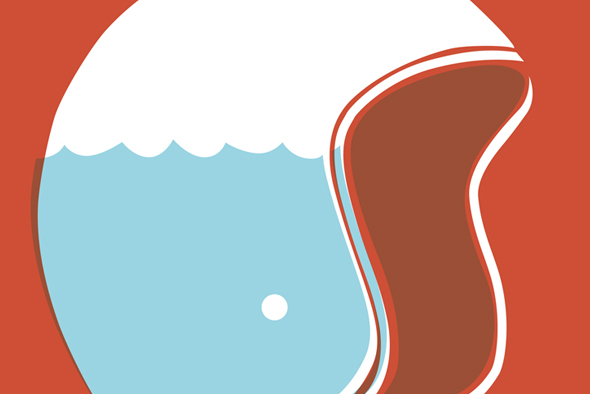 This entry was posted on Thursday, July 11th, 2013 at 2:14 pm. It is filed under ANCHOR NEWS. You can follow any responses to this entry through the RSS 2.0 feed.